I always wanted to be a pharmacist, I work for a pharmacy chain in the US. I’ve studied a lot. I’ve been working for a large pharmacy chain in the USA for seven years. I liked the idea of listening to people, giving them healthcare advice, giving them their smile back. I’ve always loved “smiles”, so much so that when I saw my wife’s during our third year of chemistry at university, I fell in love with it. Today we have two amazing children, Liam and Olivia. … When one is lucky enough to be “healthy””. And I know this all too well. I was 13 when my father grew ill and my life completely changed. It felt like there was a huge hole and every night I woke up thinking I was going to fall into it. So many nightmares, so much worry…so much medication! That was when I decided to become a PHARMACIST, I wanted answers. Had I understood the chemistry, maybe I could have found the solution to improve my father’s life, my family’s life, my life. I am a pharmacist in the USA, I work for a large chain. Everyday I leave my house, I say goodbye to my family, and go to work. I put on my white coat and I stand behind the counter. I welcome customers with a “smile”, ready to listen, understand, help. This is my job, it’s what I love doing, but I WANT MORE! This job has given me a lot and in these last 7 years I have grown professionally. I have been on lots of courses and I have worked with lots of people. You need time to build trusting relationships, time I don’t have due to the pressure I am under every day. People want to talk, they want to compare notes, but I cannot dedicate the time I need, because I literally don’t have any. THE TRUTH IS I CAN’T TRULY BE A PHARMACIST! People come into the pharmacy and they go straight to the prescriptions counter, often in their own world, often on their phones. They smile back and they immediately feel better! FROM TOMORROW THINGS WILL CHANGE! You need to take the time to get to know people better and to develop partnerships. You need time to better their lives and starting tomorrow I’ll be managing mine. Please excuse my outburst, but I had to get it off my chest! I am a pharmacist in the USA, and starting tomorrow I will NOT work for a large chain because I am opening my own INDEPENDENT PHARMACY. I won’t have to make promotion cards! I won’t have to follow campaigns set by multinationals! Together with my wife we have decided to make our dream come true, to build the future of OUR family. I have learned how to organize rules and procedures from the pharmacy chain I worked for. I have contacted experts from across the world to create a new concept of the pharmacy: experiential and phygital; an Italian company who has worked in 28 countries including the USA. With Sartoretto Verna’s support we defined the planning of the spaces, a design that allows clients to immediately recognize our position, and all of our communication. A unique and recognizable pharmacy, specialized in its offer of products and services. A community pharmacy that knows the needs of its people. A pharmacy where people will go to feel good about themselves and not just when they have a problem. A place where people will have a memorable experience, and a story to tell. Ready, set, go: “The Smiling Pharmacy” is coming! Are you a pharmacist in the USA? Do you want to make your independent pharmacy dream come true? A unique and successful business that focuses on people’s needs? 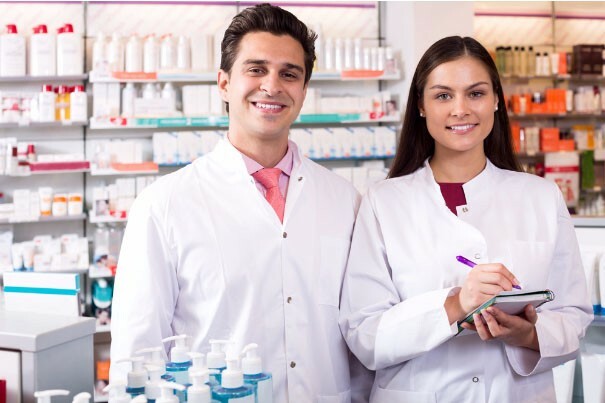 We’ll show you how to make your pharmacy dream come true with our support.